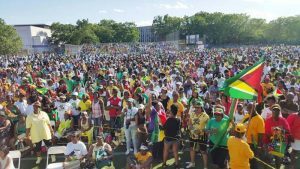 Jun 16, 2016 – Kaieteur News – NEW YORK: A mammoth parade through the streets of Brooklyn and a massive Unity Concert at South Shore High School Park, Brooklyn, brought the curtain down on the one week New York celebration of Guyana’s Golden Jubilee of Independence. The New York Guyana Jubilee Celebration from June 4 to June 12, 2016, was organized by Guyana’s 50th Independence Anniversary Celebration Committee (New York). A section of the attendees at the Guyana Jubilee Unity Concert last Sunday in Brooklyn. The Alliance For Change (AFC) says that too many responsibilities have been placed in the hands of Minister of State, Joseph Harmon. The Party thinks that this is the root of many problems in the coalition government which it is a part of. In a statement issued last evening, AFC revealed that key leaders met yesterday on a retreat which is part of an ongoing effort to review the party’s performance. At that forum, the politicians also discussed a number of issues of concern to the Party. 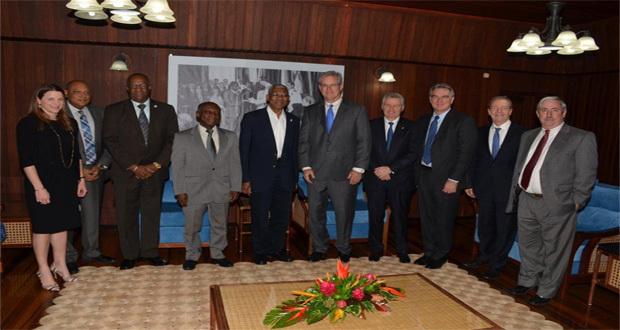 The AFC also reviewed and considered internal matters with regard to the party’s operations and structure along with its role as part of the Coalition Government of Guyana. Chairman of the Board of Directors for Guyana Power and Light Inc. (GPL), Robert Badal, has confirmed the sacking of Colin Welch, the Chief Executive Officer (acting). Welch was appointed to act as the company’s head six months ago, but his tenure was rocky, with several clashes with Management. He was fingered, via a number of leaked texts and Skype messages, in an attempt to tamper with an $800M contract to buy prepaid meters from a Chinese contractor. There were questions also about his qualifications and whether he was a Harvard graduate. Minister of Public Infrastructure, David Patterson; Minister within the Ministry, Annette Ferguson; and Minister of Natural Resources and the Environment,Raphael Trotman during their engagement with Canada-based company, Greenheart Tree Energy. A newly-formed Canada-headquartered solar energy company has signed a Letter of Intent with the Guyana government to supply clean electricity, the Chief Executive Officer of Greenheart Tree Energy, Esmonde Klass. 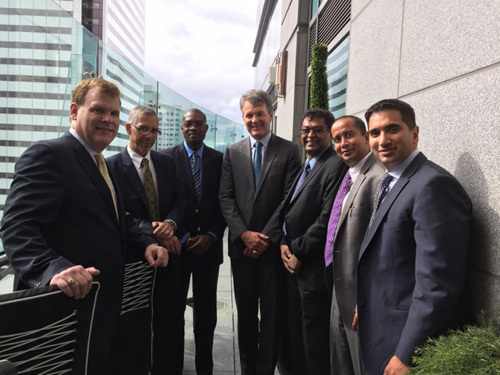 Minister of Public Infrastructure, David Patterson (at left) with members of the Dutch Risk Reduction team. A Dutch Risk Reduction (DDR) team has recommended that Guyana continue to dredge its drainage system and ensure the water flows off the land properly and implement a high-tech system to improve water management. David Patterson must be the most unfortunate of ministers. There he was, blessed with that all-important attribute which is so rarely found among members of Guyana’s governing classes ‒ common sense ‒ setting up task forces, getting pumps mended, desilting canals and generally cleaning up Georgetown, when we were visited by yet another pluvial inundation. And this time, the rain was relentless. So here we are again, with rivers flowing down our major thoroughfares and lakes swirling in suburbia. Venice, it must be said, has nothing on GT.